A Most Beautiful Deception. Melissa Morelli Lacroix. University of Alberta Press. Edmonton, Alberta. 2014. 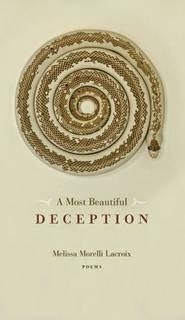 A Most Beautiful Deception indeed, to write poetry of this calibre is always a deception of sorts. The tapestry of misdirection. It's the same with the best magicians. I don't know much about classical music so I'm sure I'm missing some of the references Lacroix is making to musicians and to particular works. This is of little concern. It doesn't matter because Melissa Morelli Lacroix uses music as a diving board to jump into a much deeper pool. One where we all swim. These compelling poems contain an orchestrated lament, a poetic howl with a cultured voice. Lacroix is all about asking herself and the reader some big questions. does this with a wicked good sense of humour, a gallant charm. Melissa Morelli Lacroix is quite fearless and tackles many demons most lesser mortals would leave undisturbed. Not Lacroix. She brings humour, warmth and intelligence to every dark omen lurking in the shadows. Lacroix is not hesitant to turn her rapier eyes on herself with equal vigor. What fine poetry. Melissa Morelli Lacroix is an Edmonton-based writer and writing facilitator. She studied French, Translation and Creative Writing at the University of Alberta and has a master's degree in creative writing from Lancaster University. In addition to writing, Melissa has taught piano for twenty years, which infuses musical themes and lyricism into her writing. Melissa's work has appeared in Canadian, American and British print and on-line publications such as Crave It, World on a Maple Leaf, Family Pictures, Ars Medica, Other Voices, In the Red and The Dawntreader. Her fiction and drama have been read and produced on CBC Radio, at the Walterdale Theatre and by Rabid Marmot Productions.